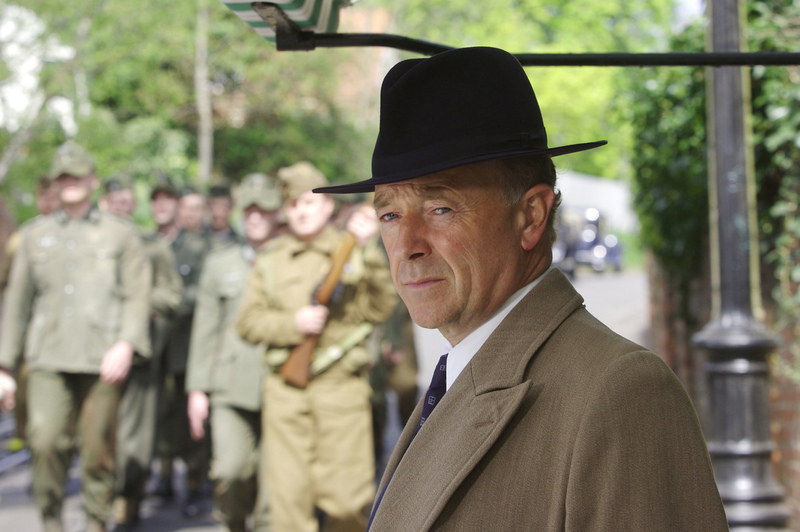 Michael Kitchen plays the titular detective in “Foyle’s War” on PBS. The new sixth season of the applauded British ITV series, “Foyle’s War,” will air on PBS Masterpiece Mystery on Sundays May 2, 9, and 15, 2010. This engrossing new series joins the highly praised first five that have been aired in the U.S. since 2003. Series V was to have been the final season for “Foyle’s War,” but fortunately, the program continues with three gripping new 90-minute episodes. Set in the quiet coastal village of Hastings, England, during World War II, the first five seasons followed police Detective Chief Superintendent Christopher Foyle (Michael Kitchen) as he unperturbedly and expertly fought murder, treason and other war-related crimes on the British home front. In Series VI, although the war in Europe is over, Foyle’s War is not. The first new case, “The Russian House,” finds Foyle pursuing an escaped Russian POW. Even though the Soviet Union was Britain’s ally during the war, some Russian soldiers changed sides to fight for Germany. Captured by the British Army, they fear being repatriated to Russia. The War Office inexplicably wants Foyle to track down the Russian fugitive at all costs. The escapee has a friend who’s working for eminent artist Sir Leonard Spencer-Jones. Sir Leonard is found dead, an attempt is made on Foyle’s life, and the investigation converges on a mysterious London center of anti-Soviet activity called the Russian House. In “Killing Time,” Foyle must fight mounting racial tensions, as black American GIs wait to be shipped home. Both the U.S. Army and local authorities want to keep them segregated, bringing Foyle into confrontation with the U.S. Army. With tempers flaring, a vicious murder occurs. In The Hide, Foyle is no sooner retired — after many attempts — than he is drawn into a cause that will have surprising personal repercussions. There’s a new budding love interest for Foyle’s spunky and adorable driver, Samantha Stewart (Honeysuckle Weeks). Adam Wainwright was an intelligence officer at Bletchley Park during the war; he now runs a dilapidated rooming house — with Sam’s help. The writer for “Foyle’s War,” Anthony Horowitz (“Collision,” “Poirot”), has created an engaging and admirable protagonist. Christopher Foyle is the quintessential British sleuth: fair-minded, courteous and articulate, yet steely and determined when pursuing criminals and hypocrites who obstruct the war and peace efforts. Michael Kitchen (“Reckless,” “Oliver Twist”) is exceptional in the role. He portrays Foyle with a world-weary and restrained heart, a small persevering grin, and, when confronted by obstreperous and bureaucratic military officials, a slight insouciance. Honeysuckle Weeks is a terrific addition to the cast and makes up for Foyle’s sometimes-wooden sergeant (now sometimes-wooden detective inspector), Paul Milner (Anthony Howell). There is something very comforting about “Foyle’s War.” Foyle’s morality is clear. The rule of law is respected. There is gentleness in society that, unfortunately, one can only find these days in historical drama. Each episode of “Foyle’s War” Series VI will be available to view online at pbs.org/masterpiece for 30 days following its premiere. ©Emily S. Mendel 2010 All Rights Reserved.